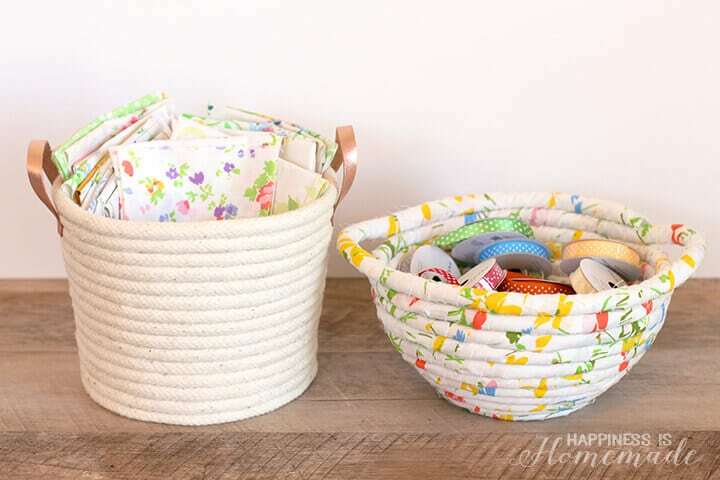 These chic DIY rope baskets come together easily with Elmer’s new CraftBond® Hot Glue Gun and Less Mess Glue Sticks (no more drips & glue strings!)! 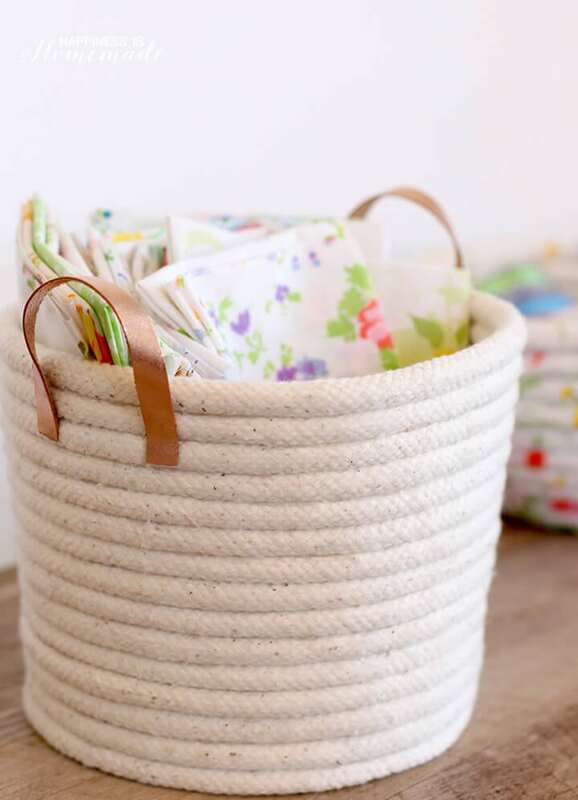 These DIY rope baskets are the perfect way to make your own customized storage and organization solutions! They can be made in a vast array of shapes and sizes, and they’re surprisingly strong and sturdy! I covered a metal pail with a sheet of parchment paper to provide a layer of protection and to form a barrier against the glue. 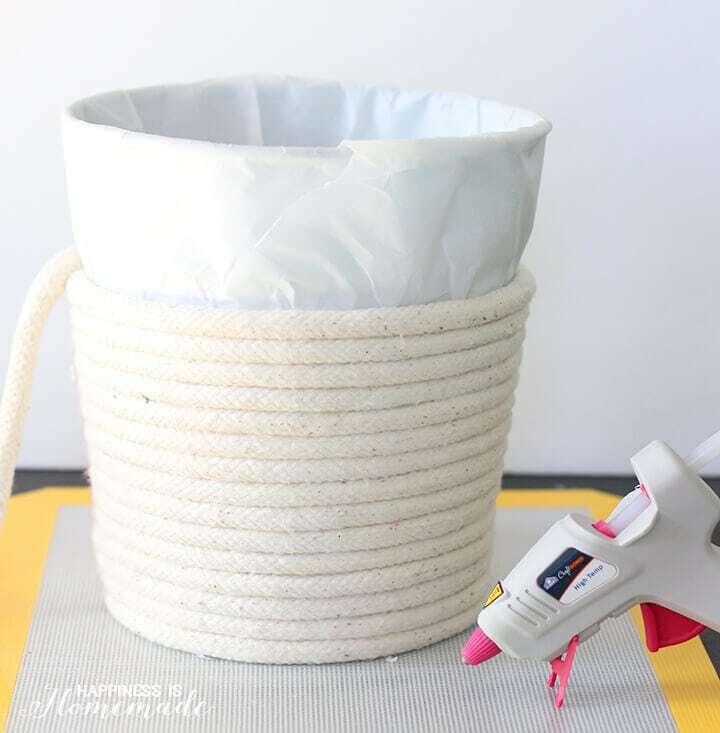 When my coiled rope base was the same size as my metal pail, I started wrapping the rope tightly around the pail (gluing the rope every step of the way!) to form the shape of my basket. 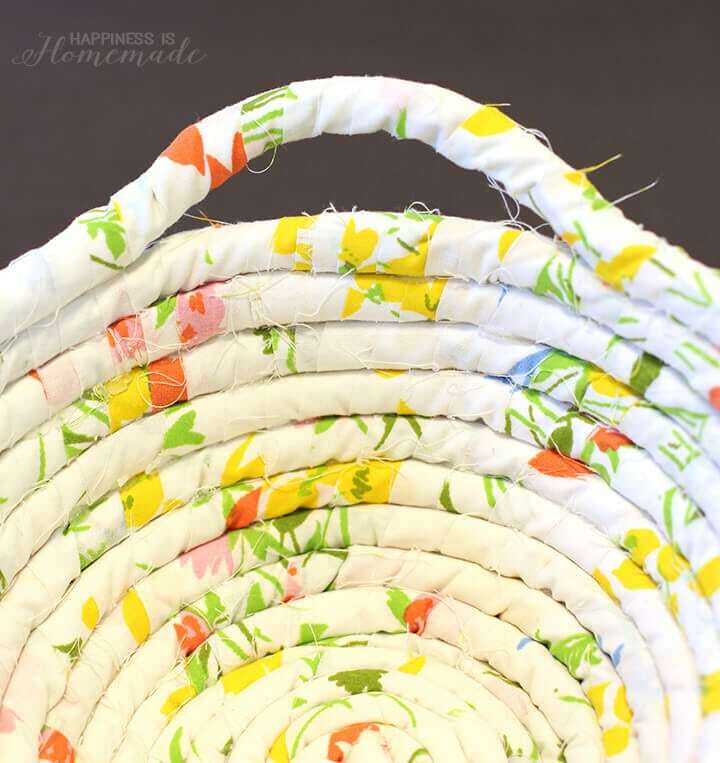 When the basket was as tall as I desired, I simply removed the pail from the inside – easy peasy! 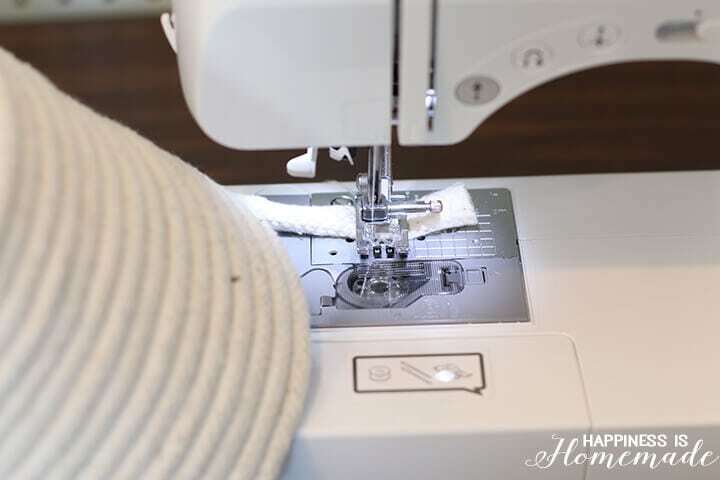 Okay, okay, I know that I said this is a “no-sew” project, and it totally CAN be…but, for added strength and stability, I chose to stitch the end of my rope closed since the piping cord has a tendency to unravel at the ends. 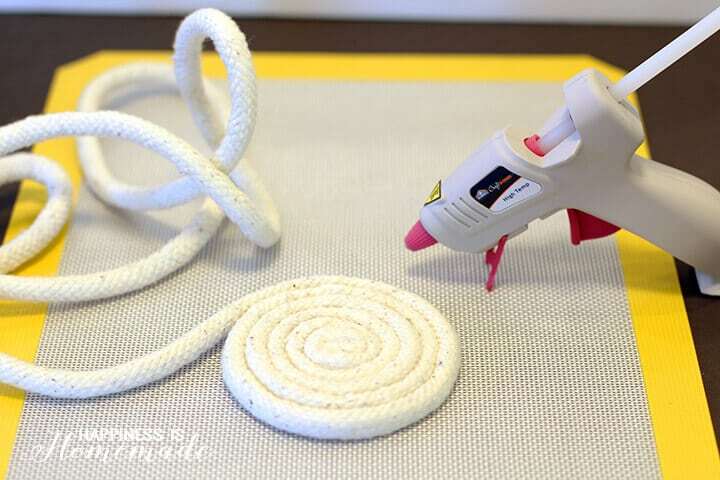 You can also use the hot glue to create a finished end piece. 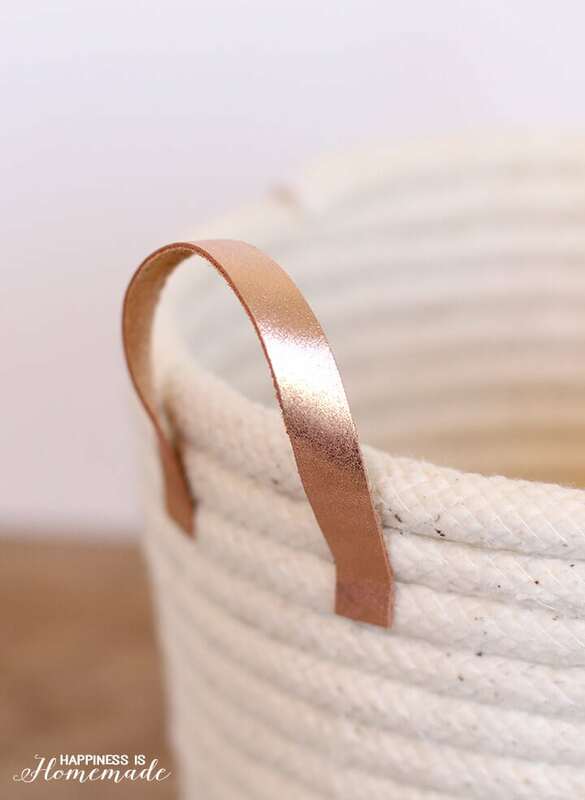 I love the natural color of the cotton rope basket, but I also wanted a little bit of glam and shine, so I added two handles made of of luxurious rose gold leather. It’s the perfect finishing touch! I’ve discovered that this basket size is incredibly handy for lots of different applications, so I’m planning on making a bunch more! This one is currently home to some of my favorite vintage sheet fat quarters, and it makes me happy every time I see it! 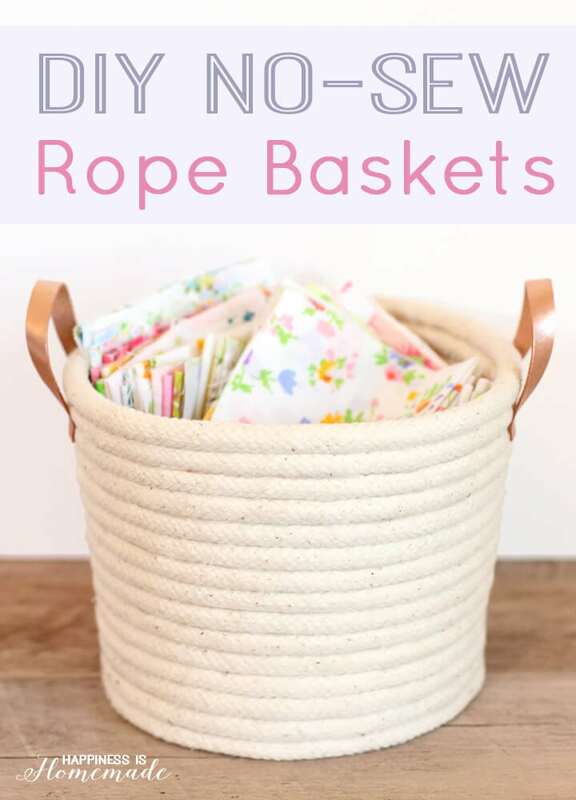 Speaking of vintage sheets, I decided to try my hand at a second version of the rope basket, based off of the fabric-wrapped baskets that my mom used to sell at craft fairs when I was a kid. I started by cutting a vintage sheet into 1.5″ strips (note: I used about 1/3 of a full sized flat sheet). 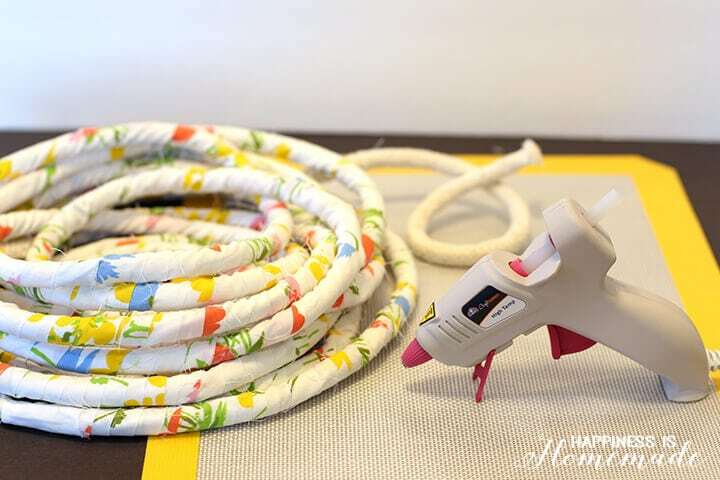 Wrap the fabric strips around the length of rope, and use your super awesome Elmer’s CraftBond® Mini High Temperature Glue Gun every 1-2 inches to adhere the fabric to the rope. 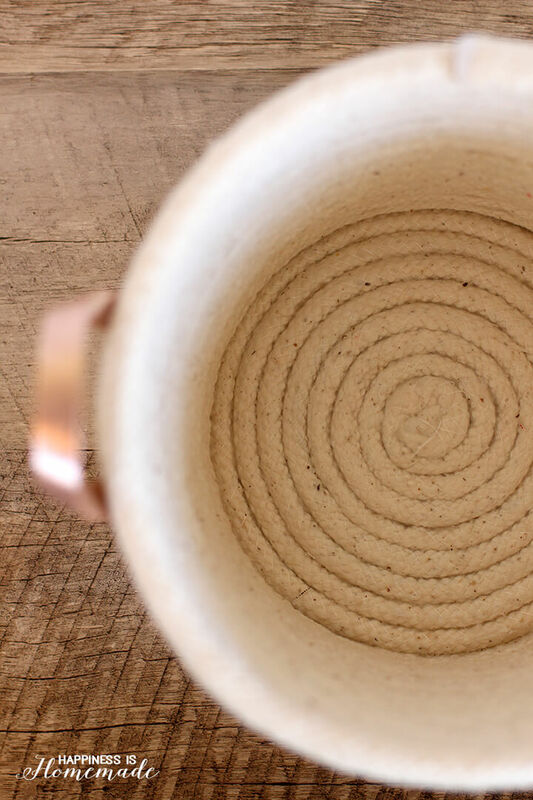 Using the same method that I used for the natural rope basket, I started with a base coil, and then built upon my vessel (in this case, a medium-sized Pyrex bowl) to form the shape of the basket. I omitted using hot glue from two 4″ long sections along the top coil of rope, and allowed them to bow up gently to create handles. 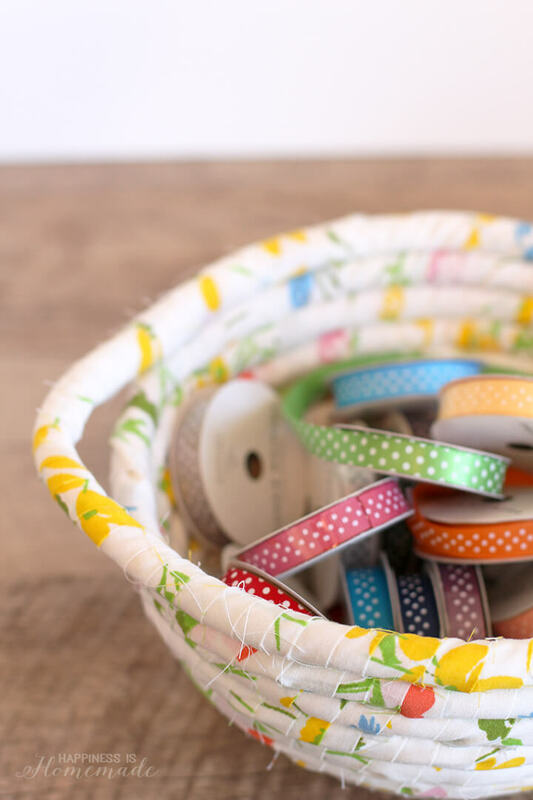 I love the way that it turned out, and it’s the perfect size for storing all of my spools of polka dot ribbon! 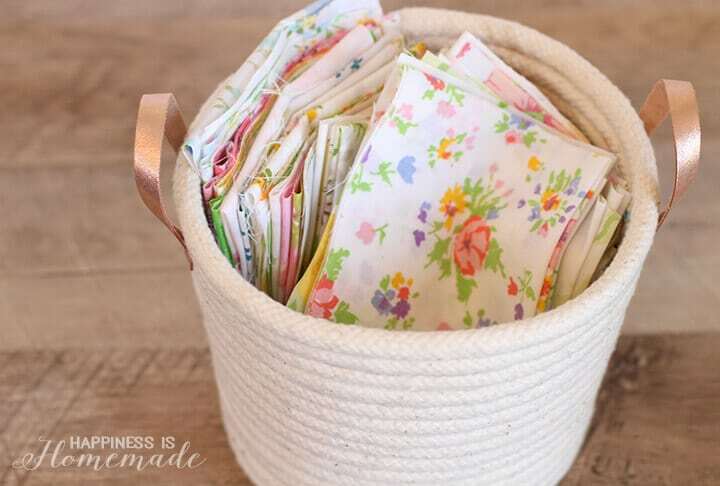 I can see a LOT more of these vintage fabric covered baskets in my future as well! 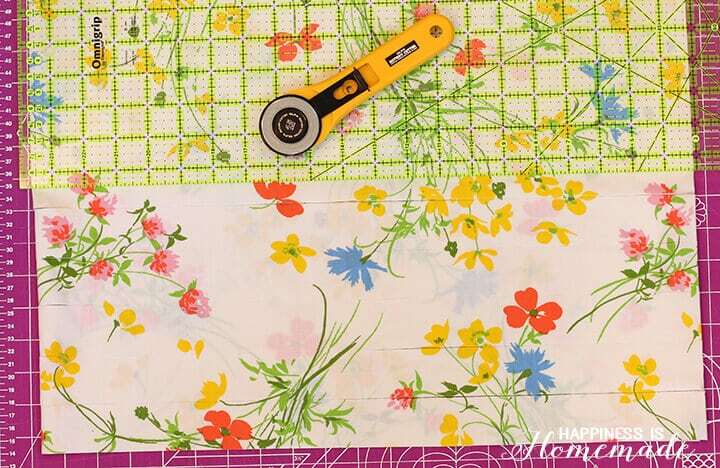 Maybe I’ll even mix and match my fabrics next time (just like my mom used to do!)! Would fabric glue work as well? 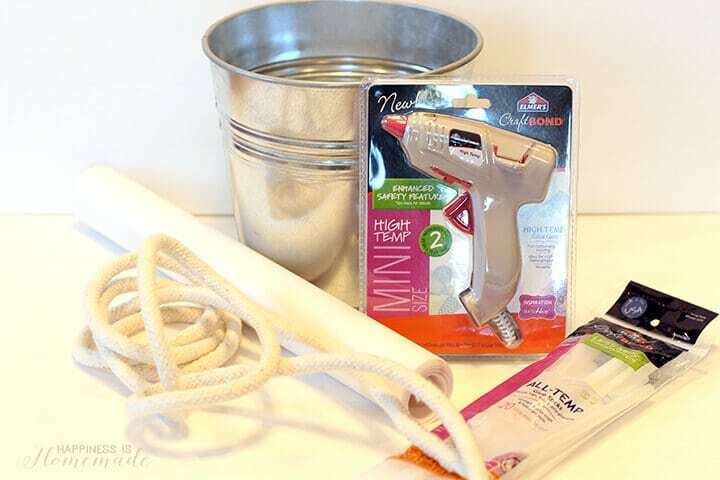 What size of pail did you use in this demo? You’ve done a fantastic job. So classy looking! Thanks, Corinne! I used a pail that is 8″ tall and 7″ wide. How did you attach the base to the sides? Hot glue as well? Hi Kelly, the base and the sides are one single piece. If you look closely at the step-by-step photos you can see that I coil the base and then move the rope to the top of the top of the base to start coiling the sides. Did you glue the handles on? If so, do they seem pretty secure? Could you use cotton rope instead? I think that would probably work, Emma! I am loving these baskets ! I must try to make these. Thanks for the tutorial ????❤???? So cute! Where can you buy the leather straps (handles)?? I made one and I love it. Thank you for the tutorial. So what happened to the parchment paper? Wasn’t it glued to the cord too when complete? The parchment paper is non-stick, so it acts as a protective layer between the bucket and the rope. Any glue that gets onto the parchment paper peels off easily, and it does not stick to the rope cording at all. 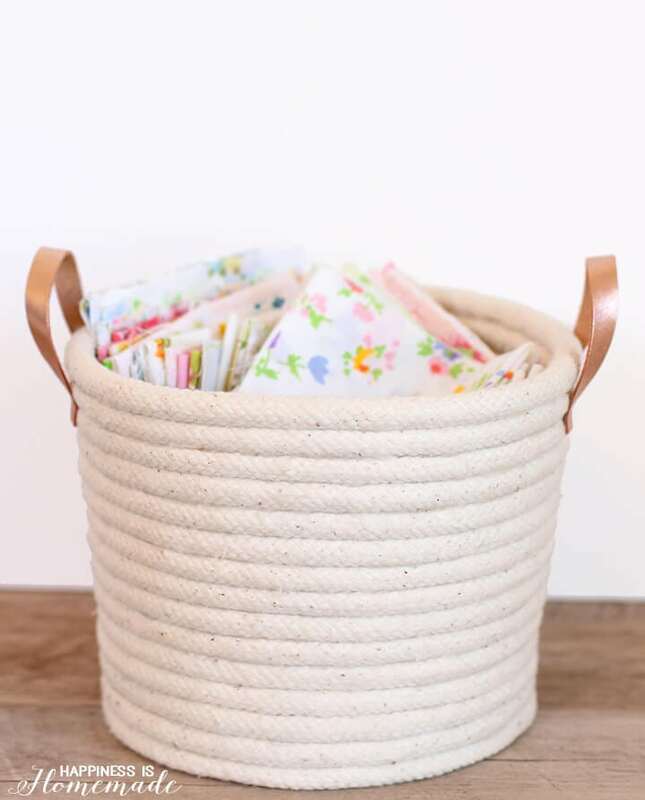 Love these baskets and must make some. Thanks for inspiring me to get creative again. 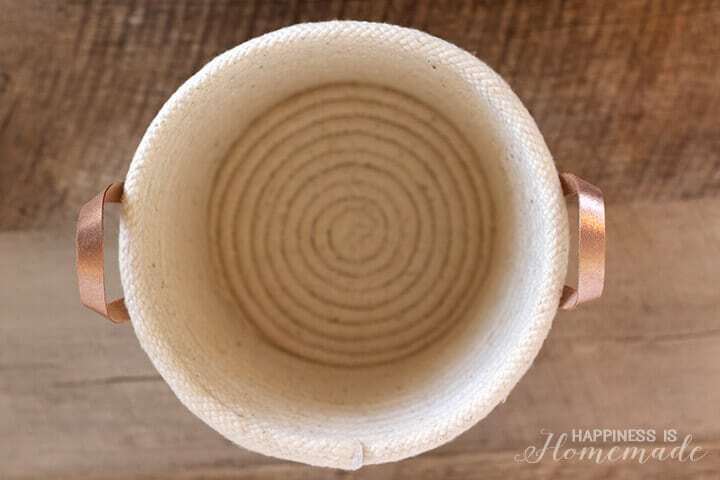 Hi Heidi, I tried to make one of the rope baskets and I used the hot glue gun and parchment paper, but when it was time to take the parchment paper off the hot glue was on the inside of the bowl dried but it looked bad. 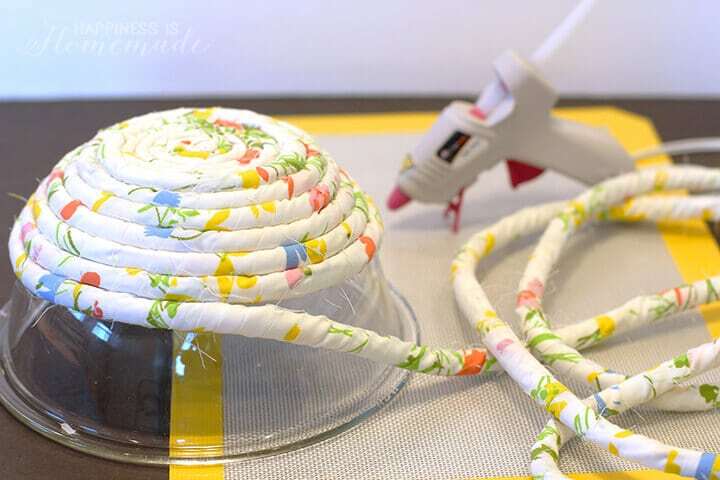 I really what to try again and make one but how did you keep the glue from getting on the inside of the bowl? Hi Heidi! A group of us girls want to get together to make these. Is it ok if use this picture and tutorial? I just finished making a Nautical Rope basket for my sister as a gift. I found your sight while looking for a way to cover up the glue that got on the inside of the basket. Your work is absolutely beautiful. I need to invest in the Elmer’s Glue Gun and Glue Sticks. 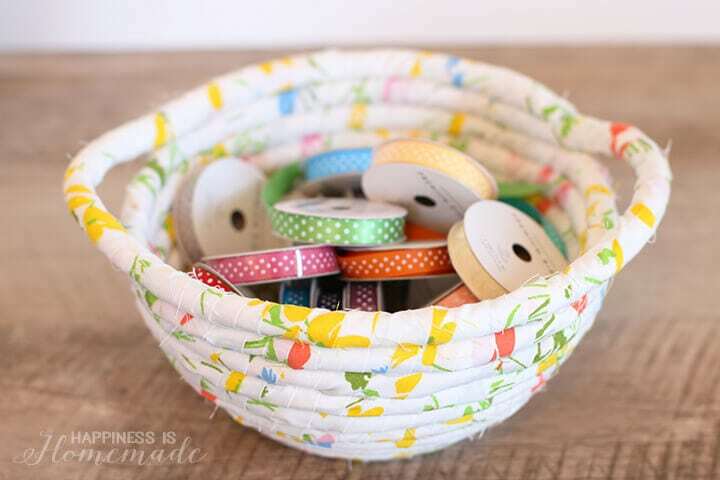 Hope you don’t mind but I think I am going to try and make your fabric baskets.